You've already seen the 2013 Hyundai Elantra GT, which we erroneously called the Elantra Touring. It turns out Hyundai's updated the styling of the Elantra hatchback, but went back in time for the name. Allow us to explain. In 2001, Hyundai offered the then super boring Elantra as a slightly more interesting five-door hatchback based on the single Elantra platform. They called it the "GT" but dropped it in 2002. A few years ago, Hyundai released the Hyundai Elantra Touring, which was actually based on the European i30 and not the domestic Elantra. 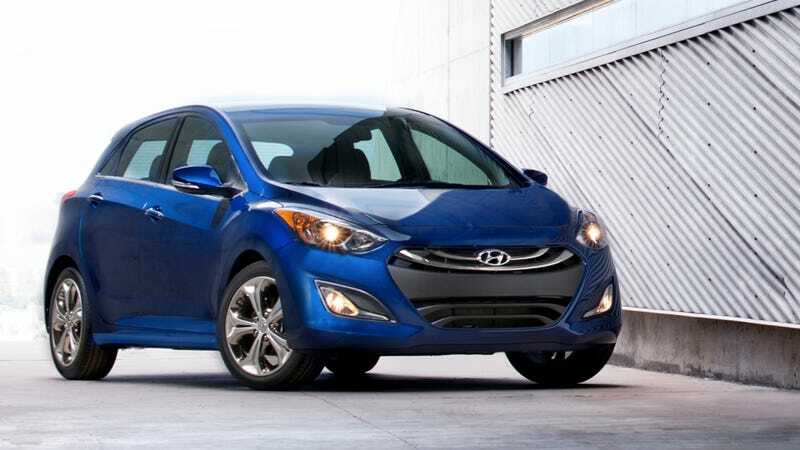 Now, in 2013, Hyundai has revealed another i30-based hatch. It looks a let less like a low-rent Chinese Mazda3 knockoff and more like the Elantra, which is a good thing. Just to confuse us, they've dropped the "Touring" name and now call it the "GT" a la 2001/2002. Whew. With that covered here are the important details. The 2013 GT weighs in at a relatively light 2,745 (M/T) pounds, compared to to 2,844 for the aging Matrix and 2,896 for the Mazda3. This balances out with its relatively mediocre engine output of 148 horsepower and 131 lb-ft of torque from its 1.8-liter Nu four-cylinder engine. Not bad, and when mated to a pair of six-speed transmissions enough power to not embarrass yourself. People in this category often care about fuel economy, and the new GT will get an estimated 28 mpg city and 39 mpg highway, making it superior to everyone but the Mazda3 hatch with the automatic transmission. Hyundai's biggest success with this car is that people might actually cross shop it with with the competition now that it looks competitive.